Style: Necklace,earrings and bracelet set. Color: Silver plated and gold plated. Size: We have one,two,three,four and five row. Good choice for gift. They are wrapped with a beautiful box. 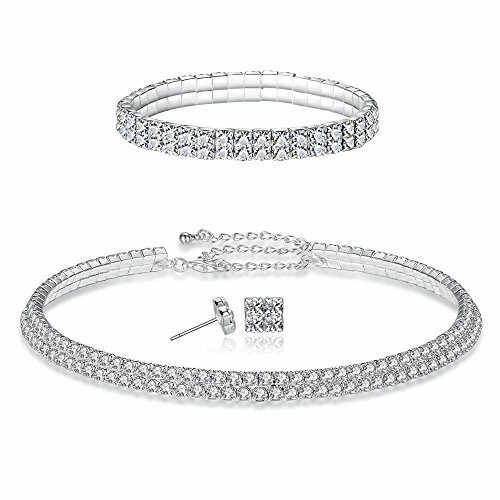 Style: Sparkling Choker necklace,bracelet and earrings set. This is made of rhinestone. 100% handmade,we promise the quality.We have silver and gold plated color for your choose. Size: 1.necklace length: 13-17in''. 2. Earring Length: 0.6in" . 3. Bracelet Length: adjustable. We have different sizes: one,two,three,four and five row. Various Occasion: Ideal for Bridal, Wedding, Prom, Pageant, Bridesmaids, Parties,Homecoming, Black Tie Formal Affairs, Holidays, Special Occasions, Birthday, Valentine's Day, Mother's Day or Anniversary Gifts. They will mach with your clothes. Wrapped with a box to make sure the good condition. This is a good choice as a gift. 30 Day Money Back Guarantee, what you see is what you get! If you have any question, please feel free to contact us. If you have any questions about this product by FANCY LOVE JEWELRY, contact us by completing and submitting the form below. If you are looking for a specif part number, please include it with your message.